You can go home again. Email Leigh Henson at dlhenson@missouristate.edu . Oh, wind, why do you blow so strong and gay! We cannot get them even as we try. . . The image of 34.1 dates to about 1914. This 1900 structure stood alone until 1925 when the red-brick building was attached, as seen below in 34.4. The scene in 34.1 shows the rounded tower of a house at the right and the red-tiled roof of a large house at the back across from the alley. The street shows the tracks of the streetcar, and the curbing is stone. In the background at the left is the First Presbyterian Church, constructed in 1896. "In 1898, a proposition was submitted to the voters for the issuing of bonds in the amount of $30,000 for the purpose of erecting a high school building and two other school buildings in the Second and Fifth Wards, all of which were badly needed. This proposition carried by a vote of 148 to 37. Preparatory to the erection of the high school building, the lots on Broadway, between Kankakee and Ottawa streets, known as the Knapp property, were purchased for the sum of $4,000. The brick house upon the lots, for many years the residence of Colby Knapp [instrumental in moving the county seat from Mt. Pulaski to Lincoln and later mayor of Lincoln], was taken down and removed. The lots measured 120 by 150 feet. The contract for building the new high school building was let to Martin Lori, of Huntingburg, Ind., for $18,150, the plumbing and heating contract being let for $2,670 additional. The corner stone of the building was laid May 5, 1899, under the auspices of the Masonic orders of Lincoln. Dr. L.L. Leeds, president of the school board, presided at the exercises and addresses were made by Father Donavan, of St. Patrick's church and Prof. A.E. Turner, of Lincoln University. 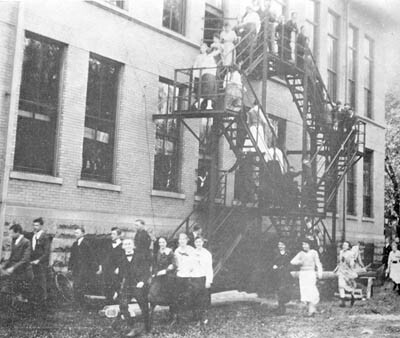 The building was dedicated Jan. 5, 1900, on which occasion, addresses were delivered by Mayor E.G. King, Dr. Katharine Miller, D.H. Harts, and Mrs. L.L. Morrison. The new building is an attractive piece of architecture, J.M. Deal, of Lincoln, being the architect [Stringer writes that J.M. Deal was also the architect of the 1905 Logan County Courthouse (p. 239) and the 1902 Chapel-Administration Building of Lincoln College (p. 444)]. 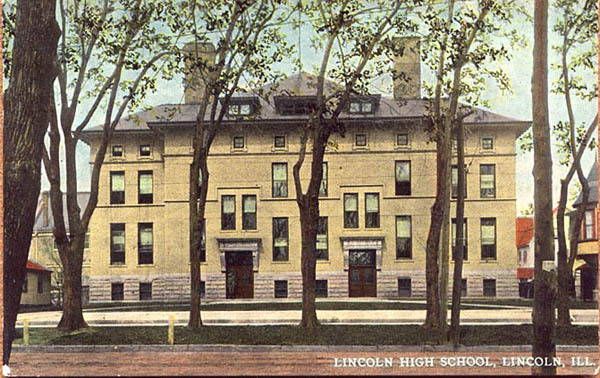 The [Lincoln High] building is 73 by 100 feet in size and is three stories and an attic in height. The architecture is a modified form of the Italian renaissance. The walls are of yellow pressed brick, the roof of slate and the high basement story is constructed of Bedford stone. The basement story has a ten foot ceiling, contains the entrance to the building, two recitation rooms, a furnace room, storage room, fuel cellar and closets. The first story proper has a thirteen-foot ceiling, three grammar grade rooms, two recitation rooms, a room for teachers, a girls'' room and a hall 18 by 60 feet. The second story has a sixteen foot ceiling, a large high school room seating 268 pupils, two recitation rooms, cloak rooms and a superintendent's room The attic contains laboratory room and apparatus rooms. The entire cost of the buildings and grounds was about $20,000" (p. 428). Note: the "large high school room seating 268 pupils" on the second floor became the famous Room 316, the subject of many interesting and fond memories, some of which are offered later on this page. 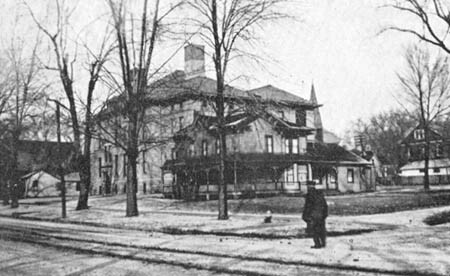 Note the streetcar tracks, foreground, in the center of Broadway Street and the spire of the 1896 First Presbyterian Church in the background immediately to the right of the school. The Cumberland Presbyterian Church, corner of Broadway and Ottawa Streets, appears at the left of the school. The school poem below was composed by my maternal grandmother, Blanch Hoblit Wilson. She expresses the wistfulness of a more genteel age. O wind, why do you blow so strong and gay! That they are gone ere we can make them stay. That something interferes and they are gone. We find that it has done to us no wrong. Photo 34.4 shows a winter scene in 1954-55 with school buses waiting (they seem small) just before dismissal. This photo also shows the numerals which graduating seniors painted on the chimneys of the 1900 building. This scene is remarkable because it shows the rare time when a class used both the upper and lower sections of a chimney for its numerals. Also, 1953 was the year of the centennial of Lincoln, Illinois. The 1956 Lincolnite shows that the Class of 1955 had painted over the 3 of 1953 with its numerals: "55," leaving the 5 of 53 and puzzling onlookers over why a lone 5 remained on the top half of the chimney. Paint and advice furnished by George Culleton the sign painter (his son was Carson Culleton). I knew George and talked to him about it, and he volunteered to donate the paint and how to do it including making templates." Respond to Leon at lzeter@charter.net. "My memory is a bit fuzzy on all the details but one I know for sure is that I was on the ladder as an "artist" for the '56 chimney. Sorry but I haven't any photos either. Some of the names that come to mind as co-culprits are Pete Funk, Dave Dutz, Jitter Rolfs and maybe Jack Ritchhart. Never saw a janitor. Was never "inside" the building. Access from the alley directly to the roof. We talk about it in generalities at reunions but not much in detail. No doubt you'll hear from some others on this subject." Respond to Jim at jhwoodruff1@msn.com. My father, Darold Henson, told me that Principal W.C. Handlin allowed seniors to conduct this annual ritual unmolested. The height and size of the letters suggests this activity was daunting and dangerous. 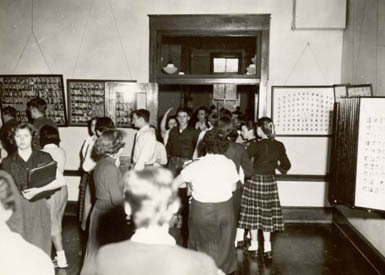 Beginning in the first year of the new LCHS in 1959, the Comrade stopped the ritual after the noble Class of 1959 attempted to perpetuate the tradition. I have so far been unable to coax any members of the Class of 1959 to tell the full story. When someone is willing to do so, it could be published here (anonymously, if preferred). Students in 34.5 are using the window to exit Room 316. Photo 34.8 shows the fire escape through the window at the back. Note that the boys dressed in coats and ties; the girls wore skirts or dresses. Veteran of World War I (United States Navy), coach and teacher by precept and example, one of the organizers of the Big Twelve, President of the Illinois Education Association, candidate for the office of Illinois Superintendent of Public Instruction in 1942, charter member of Lincoln Kiwanis, member of the Logan County Historical Society, member of the Logan County Farm Bureau, member of the board of the First Christian Church, and devoted Lincolnite (Gleason, Lincoln: A Pictorial History, p. 94). Before WW II began, my father, Darold Henson, LCHS Class of 1936, was hired by W.C. Handlin as a bus driver and custodian. Dad observed that Mr. Handlin "ran a tight ship." Dad said that in his job interview Mr. Handlin asked him if he smoked or drank. Dad recalls one instance in which Mr. Handlin enforced the dress code. From his office window on the second floor, Mr. Handlin could observe students coming to school. One day he noticed Frank Froschauer was coming to school in bib overalls instead of the required slacks. As Frank climbed the stairs, he found Mr. Handlin waiting for him at the top. Frank was knocked down the stairs. Another example of this "old school" approach to discipline involved Paul Holderer, who told Dad about his "moment of truth" experience with Mr. Handlin some years after it happened. Paul was one of those students whom teachers often sent to the office. On one of those days, Paul said he noticed Mr. Handlin did not seem to be feeling very well. Standing in Mr. Handlin's office, Paul said, "I think I can whip you." Mr. Handlin pushed the large library table up against the door to block any escape. According to Paul, "I found out I could not." Dad noted that Mr. Handlin had been trained as a boxer. 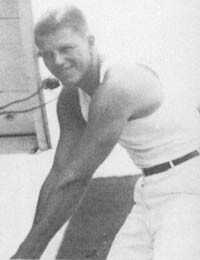 Staying in shape, Frank worked at the Lincoln "ice plant" during summer break from the U of I, where he played football and starred at basketball. Dad said that teachers often visited the boiler room to sneak a cigarette. Mr. Handlin sometimes appeared unannounced. On one of those days, Walter Alde, drafting and building trades teacher, moved quickly to hide his weed. Later, other teachers accused him of swallowing it when Mr. Handlin suddenly appeared. Dad said that in the 1930s seniors took their trip to New Salem for a picnic. Mr. Handlin and many of the faculty rode the bus with the students. The annual student-faculty softball game was held after the picnic, and Mr. Handlin was the umpire. I asked Dad if Mr. Handlin were impartial, and Dad said Mr. Handlin occasionally favored the faculty despite the good-natured protests of the students. Dad described the time in which a frustrated student got in Mr. Handlin's face, protesting a close call. Apparently Mr. Handlin leaned forward and said, "I make the decisions here!" 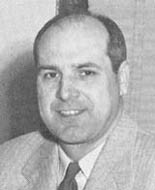 During a school board meeting in January, 1953, Mr. Handlin passed away suddenly. In the Centennial Celebration at the end of August, 1953, twenty-one men and women were named to the "Hall of Fame": those who had the greatest influence in the development of Lincoln, Illinois; and W.C. Handlin was a member of this "Hall of Fame" (Lincoln Evening Courier, September 3, 1953, p. 7). At the left is the doorway into the hall and stairs leading down to the west front entrance. At the back left is the door to a classroom used by English Teacher Arlette Eiten. The back left window shows the fire escape at the west end of the building. There was also a fire escape on the north side at the right, beyond view. The following stories by LCHS alums of the 20th Century were emailed in June and July, 2001. Respond to Jerry at j42gibson@aol.com. I wonder if anyone else remembers this incident that occurred in Room 316. Mr. X was in charge of my study hall in 316 and he had a very unique way of disciplining miscreants. The day I recall, Woody Jones had done something to earn the punishment. He sat in the next aisle over from me, so I had a very clear view as Mr. X proceeded to grab Woody by the shoulders and violently shake him back and forth in his seat. This was not an unusual episode and would not be worth recounting, except on this particular day, the girl sitting behind Woody had fallen asleep, hidden behind her propped-up book. When Woody's muscular football-player body began slamming back and forth, the whole row of desks vibrated, sending the sleeping beauty tumbling to the floor. As if this wasn't embarrassing enough, she was further humiliated by having to spend the rest of the study period, standing at the front of the room with her back to the class. Respond to Gwen at yoshukai@knology.net. Anyway, back to the 316 story. Mr. Jack Bass came out of the nearby teachers' lounge (he and some others smoked heavily) and said he wanted to talk to me. We walked into the middle of Room 316. I sat down, and he sat in the seat in front of me and turned around to talk. Since he was my English teacher at that time, I thought he was going to offer me some constructive criticism of my work in his class (see report card on the mementos page of www.geocities.com/lincolnhigh1960). Instead, he explained that he was the Lincolnite advisor and needed a sports editor for the coming year, and he asked me to consider doing this job. I don't think I really was interested in that sort of activity because I was a bit shy and because being on the yearbook staff didn't exactly carry the prestige that sports participation did. Up till then, about all I did was go out for cross country, freshman basketball, and track (and was not very good at any of those things -- I have always been a "late bloomer"). Yet, here was a teacher I respected who had an "assignment" he was asking me to do, so I did it. Being on the Lincolnite staff my junior and senior years led to some of the most "productive" fun I had in high school (I also had my share of "unproductive" fun). Some curious dramas played out in or near Room 316. I remember being in the hall outside 316, where Jack O. Hodgson liked to patrol. More than once I saw him grab a water gun from its owner, empty the contents in the student's face, then with large shoe stomp the plastic gun to pieces. Mark McCullough could easily march 316 offenders across the hall to his office. Students released snakes in 316 to break study hall boredom. Also, as a freshman, I remember seeing large, dark splotches on the walls there. The splotches resulted from torpedo bombs hurled by former students. As I remember (but will need help with the details, folks), a torpedo bomb was constructed of aluminum foil with a roll of caps at the center of the foil; then a very large steel ball bearing was placed on top of the caps, and the foil was twisted to hold these together. The bomb thus had a round "business end" and a tail, which helped guide the (dumb) bomb. The ball bearing was like a hammer that exploded the caps all at once when the bomb struck the wall. Thanks for encouraging me, but you may wish you hadn't soon. I seem to be full of them. When you mentioned Jack Bass, I remembered an incident about him that's kinda funny. Richard Ingram's locker was next to mine, and we were both tossing things around in our lockers when Mr. Bass walked by. He said good morning and I said good morning, Mr. Bass. Richard muttered something under his breath that sounded like "morning, Mr. Jackass." Mr. Bass spun around and confronted Richard, who was a head taller and outweighed him by probably 40 pounds, grabbing him by the lapels and, lifting him off his feet, slammed him into the locker. Sounded like a jail cell door closing. I jumped a good three inches in the air. Now, if you heard this story in this day and age, Mr. Bass would have been shot or stabbed or, at the very least, punched silly. However, Richard mumbled an apology, and Mr. Bass walked on down the hall. We had different values then or at least a healthier fear of consequences. I think that the general belief then was that if you hit a teacher, you were immediately put before a firing squad. As most of you know, both of the participants in this incident have passed on. Mr. Bass died only a few months after this incident. Richard died a few years after high school. He was electrocuted while helping my dad and my brother, Gary, put up a sign at what was then called the Blu-Inn. Gwen Koda's story featured Mr. X, and so does this one. This incident also stars Mr. Wellington "Bud" Huffaker, III, LCHS Class of 1960 and one of the members/readers on this email list. He previously told me he does not do much email. Yet, he is really the only one who can fully, accurately tell this story, so perhaps he will send his unabridged version. This incident happened some time in the 1956-'57 or '57-58 school years. 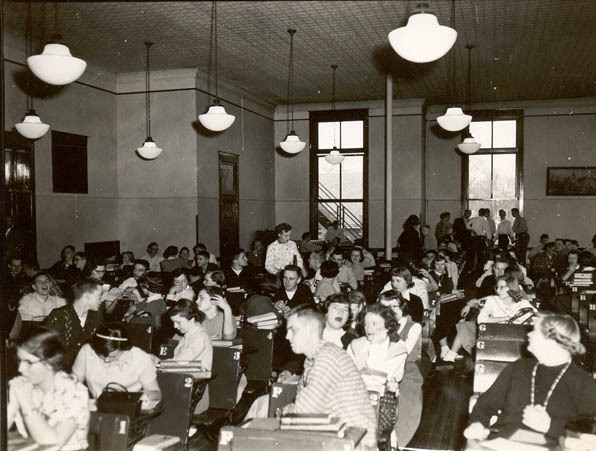 Bud's study hall seat was far down a row next to or close to the windows with the fire escape. Mr. X was at the front of the room taking roll. Someone threw something like a ball bearing up the floor of that row, and the object loudly clanged and clattered against the wrought iron desk legs all the way up the aisle. Mr. X's head jerked up from the roster, his face grim with rage. He quickly sized up the situation and decided who the culprit was. Mr. X had a fast running walk to match his temper, and he quickly reached his unlucky target and suddenly walloped Bud out of his seat. Problem was that Mr. X got the wrong guy. As I remember, Mrs. Huffaker came to school for a conference in search of some justice. I witnessed this spontaneous combustion of corporal punishment from my seat nearby, but I forget who threw the missile (think it was the person sitting immediately behind Bud). Who else out there remembers Bud's trauma and is willing to help paint a more accurate, detailed picture of this memory? I remember Room 316, the quarters, occasionally noisily rolled up the aisles interrupting the quiet. I remember one seemingly calm day in room 316 that was interrupted by a disturbance from the rear of the room. Suddenly two or three pigeons, having been let loose by one or two individuals, begin flying around and the calm suddenly turned into quite a commotion. It was quite a site, a several teachers had butterfly nets chasing those pigeons and the quarters were rolling too. Needless to say, not much studying was accomplished during that study hall, but probably the best entertainment that could had in Lincoln that day. Respond to Nelson at nelsont13@insightbb.com. One of my memories regarding Room 316 involves the times when Midge Proctor, while serving as a hall monitor, and would enter Room 316, the boys would stomp their feet to match each of her steps both when she entered and when she would leave. I believe teacher Jack Bass was in charge during that time period. Respond to Lester at ljvanbibber@hotmail.com. I remember Room 316 very well and I am sure I got in trouble from time to time, but the time I remember most was at the end of my sophomore year when Don Hopp and I went to the back lakes to catch a snake to let go in the infamous study hall. Well needless to say our caper backfired on us, because that is the night we had a wreck on my moped. I was laid up in the hospital for about a week along with Don. When Don got thrown off the cycle, he was laying spread eagle in the street knocked out but still holding on to the snake, which was in a milk carton. I do remember the pigeon episode -- a lot of covered heads and a lot of laughs. Respond to Bob at rjglick123@nctimes.net. I am thoroughly enjoying everyone's memories -- I have a memory of 316 -- when I was a freshman my brother caught a bat that had gotten into our home -- I decided to take it to Mr. Proctor the next day -- On the way to his class, Gerry Dehner stopped me and said he would take it to Mr. Proctor for me -- Being a trusting soul I gave the bat to Gerry -- he turned it loose in 316 -- I never did hear if they ever caught the "culprits." Respond to Linda at lbarrick@ccaonline.com. I fondly remember the SH in 316 in the old high school. The torpedoes bouncing off the wall, ball bearings down the aisle and general commotion over by the windows. What a treat to see the old photo and pick out some of my classmates. Does anyone remember the time when the boy’s downstairs bathroom was blasted with an M-80? It was close to the end of the school year of May of 58. There had been a couple of firecrackers set off in the bathroom the previous week right after lunch. No one was found in the bathroom. The following week someone took an M-80 and pretty well damaged the “Porcelain Throne”. From what I remember the bathroom was fairly close to the office on the main floor. No one was caught as I recall. Here is how they did it. A time delay fuse was made from a cigarette. The guys that smoked would take a few puffs of a cigarette to get it going. Next they would take the fuse of the Cherry Bomb or M-80 (these really did ROCK!) and stick it into the slowly burning cigarette. After exiting the bathroom, off to class they would go. About 5 or 10 minuets later there would be a big blast and everyone went into the halls to see what had happened. Of course no one was around, but there was lots of talk about how it was done. Respond to Norm at nlschroe@excel.net. "Love the 316 stories -- remember Chuck Roast, Jim Shoe and Bobby Pin signing up for the library? It took Jim Nordberg(?) most of a semester to catch on." Respond to Bob at E._Robert_Goebel@kywd.uscourts.gov. 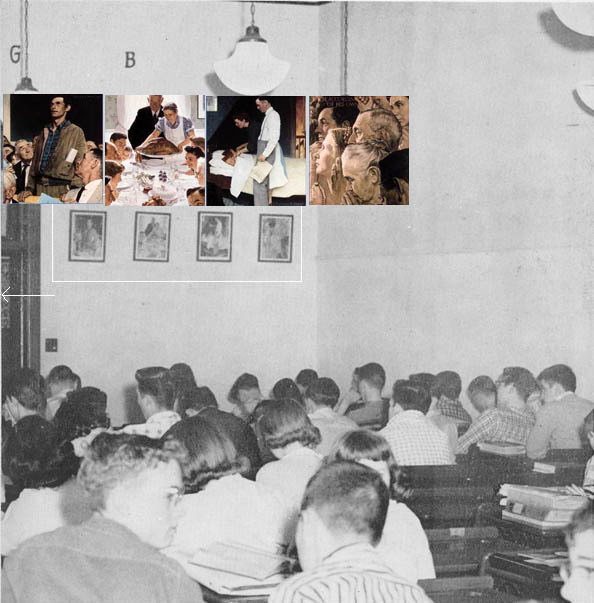 Does This School Scene of the 1950s Show Life Imitating Art? The white arrow points to framed photos of LCHS alums from various graduating classes. The walls outside the front of Room 316 contained many of these. In the photo above, the white rectangle seen on the front wall encloses Norman Rockwell's "Four Freedoms": left to right -- Freedom of Speech, Freedom from Want, Freedom from Fear, and Freedom of Worship. These were published by the Saturday Evening Post in 1943. The images are adapted from jigsawjungle.com. The following remarkable story was composed and contributed by Fred Blanford, LCHS Class of 1959, and emailed to 160 LCHS alums of the mid 20-Century on November 5, 2002. It is reprinted here with his blessing. Without getting into a too long discussion on this point, I would like to assert that Man (meaning Woman too) does not like the idea of being homogenized. That is to say, Man likes being an individual -- one apart -- a unique being. However, Man also is gregarious by nature and thus enjoys being a member of a group -- enjoying the "group's" individual identity also -- whether Elks or Eagles -- VFW or Volunteer Fire Dept. The transitory nature of temporal life is disturbing along the lines of "Is that all there is?" As an upshot -- Man goes through life -- sometimes symbolically other times literally "marking his territory" as a means of memorializing his passage. Initials carved in trees, desks, park benches--names or hand prints left in fresh concrete -- headstones in cemeteries. Many hope that the archives of their groups will preserve their names -- and hopefully to some extent -- the "mark" they made in passing. The LCHS Class of 19?? meant to mark their passage when they donated the wherewithal to provide a useful gift for those groups that would come after -- a fountain -- marble I think. It was a large and handsome fixture -- solid -- intended for permanence. For those who may have forgotten, I have attached a pic. Unfortunately for the younger participants -- only a glimpse into the past you did not know. At this juncture I had meant to say "And thereby hangs a tale." (The Taming of the Shrew. Act iv. Sc. 1) but thought Leigh would "tsk tsk" if I didn't have the words quite right -- so I looked it up and along the way found Wm. Shakespeare also allegedly said ". . . as tedious as a twice-told tale, Vexing the dull ear of a drowsy man." This sounded a cautionary note. To those familiar with the tale(s)--I apologize. Once upon a time there was a group (160 give or take) of individuals loosely known as the LCHS Class of 1959. They were the usual bright-eyed, bushy-tailed, eager to . . .etc., that you find in prickly young (17yrs or thereabouts) people. Casting about for ways to assert their (collective) individuality and disdain for the establishment and its rules -- they (I cannot state which one said it first) hit upon the idea (obviously not original) of re-instituting the Homecoming practice of "whitewashing" the streets. While in years past this had been a common HS activity -- with the regime change (that's not always a positive thing) and the hegemony of "The Comrade" that practice had been outlawed -- Verboten! A pickup truck, a 5-gal drum or so, some old brooms -- and we were in business. At least one adult was involved (attribution later) as he provided the truck, the drums AND he had checked with the local law enforcement authorities to see if anybody was going to get jailed over this. When The Comrade looked out the next morning -- curb-to-curb letters "SMILE." Once the genie had escaped the bottle (or the toothpaste had been squeezed out of the tube) -- the ban was over. An annual occurrence now -- did the Class of 59 manage to re-institutionalize this "tradition?" If that was the whole tale -- it wouldn't be much -- and would definitely not be "on topic." You see -- that lively young Class was the first round of seniors that would graduate from the NEW school on Primm Road. The above scene is undated, but is from the late 1950s. Rare photo provided by Fred Blanford and probably taken by Mike Hamilton. The older part of the "old HS" was being torn down. If that was not indignity enough to the memories of so many who had gone before -- The Fountain was dismantled and lying in pieces on the front lawn with grass growing up around it. Word was "IT" was to be preserved and installed at the new school -- but nothing appeared to be happening with it. Too much disrespect for those soon-to-be alums to take. 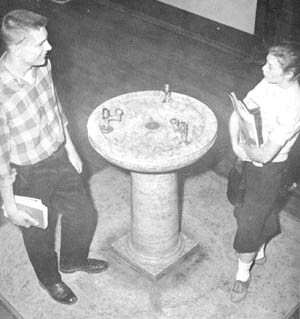 Months later, shortly before this group was to "commence," the decision was made to return the reassembled fountain -- installing it on the front lawn of the new school -- as a reminder of the promise that it would be incorporated into the new student environment. Fearing retribution -- the group determined that a post-midnight return would be appropriate and judicious -- there for all to see the next day -- without anyone losing the right to walk across the stage. Come the evening of the return, a suitable number of strong young lads assembled, loaded the fountain into the pickup and then jumped in themselves. While cruising the town waiting for the exactly appropriate time for restoration -- the pickup load of teenage boys for some reason piqued the interest of one of Lincoln's Finest -- Patrolman (later Chief) John Wodetzski -- an LCHS alum himself -- who decided to investigate. When his gumball lit up -- occupants of the pickup started jumping and the driver gave some thought to "fleeing and eluding." I am not able to say from first-hand knowledge how many were questioned by Patrolman W--as I made it safely home -- as did quite a number of others. When we reassembled that night -- the one end of the story was that Patrolman W thought it was a riot -- that we had lifted the thing in the first place AND that we had all fled for fear of going to jail. He got a big kick out of the adventure. Another sidelight was that (here's where the names really start getting named) Walter Wall (a.k.a. Bud or Buddy) had made it home safely -- but got to feeling badly that others had gotten caught -- went down to City Hall and turned himself in -- to the desk sergeant who didn't know what the hell he was talking about since John W hadn't reported anything. Now that is leadership -- what we hear so much about in this silly season -- Bud was the Student Council President at that time. In any case, the fountain was -- late that night -- reassembled on the front lawn for all to see the next morning -- but none got to see it. The Comrade must have gotten some very out-of-sorts custodians out of bed verrry early that morning -- it was gone and nothing was ever said by the administration. both LCHS Class of 1958. Photo by Mike Hamilton, also Class of 1958. For years (I checked for a while) The Fountain sat stored in a dusty corner of what was then the bus garage of the new facility. I do not know if any attempt was made to incorporate this memorial into the new facility -- or if it has been done to this day -- or if it has disappeared into some individual's garage as a curio -- or a dump?? 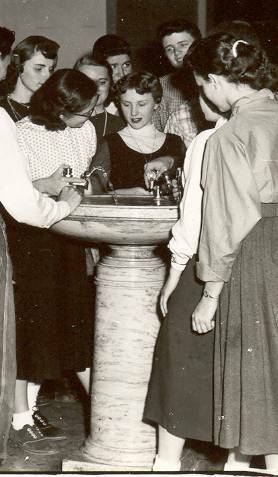 I believe most of the participants felt The Fountain needed to be restored to a place of prominence in the life of LCHS students. If it is not so dedicated at the present -- so much for the good intentions of the LCHS Class of 19??. The initials they carved were certainly less long-lived than I think any of them could have imagined. It is for this reason that I despair. Will any artifacts be preserved from either school they are about to raze? Will the new "cookie cutter" school buildings turn out better students when they have never looked up and wondered about or aspired "To Reveal Truth & Beauty?" Chuck McGee was the classmate driving the truck. His Dad, Floyd, was the adult that knew of and checked out the whitewashing -- and he knew of and helped in the "storage" of the fountain. That's all the names for this time out. Bud participates here and can defend himself. I have been trying to get Chuck to participate (I hope he has at least been lurking at the site -- I do Bcc him) and hope maybe he will jump in now to help (with Bud) clarify any portion my memory may have fogged. 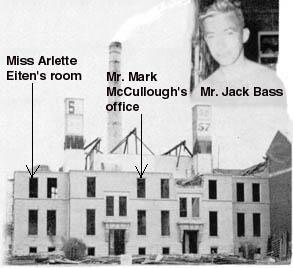 The Class of 1960 was also traumatically affected by the demolition of the 1900 yellow-brick building. After all, many of our parents and other relatives had sought enlightenment in these very halls. 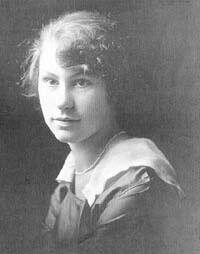 My maternal Grandmother Blanch Hoblit Wilson had graduated from there in 1918. In high school I used to see her picture in those large hanging, hinged photo folders that had been installed on the walls of the second floor in the1959 building. I wonder if they are still there, but won't hold my breath. And the old building was the center of learning administered by such pedagogic legends and Jack O. Hodgson, Mark McCullough, and W.C. Handlin. The Class of 1960 historic preservation project was somewhat less ambitious and less noble than that of our older classmates and is unworthy of historic record. But perhaps some of the perverted mindset of that adolescent time and gang yet lives, and so, gentle readers, the tale is told -- but beware, it holds no interesting plot twists, no universal truths of human nature, no redeeming qualities, and no mystery. In the late fall of 1959, the Classes of 1959, 60, 61, and 62 were enjoying the new school on Primm Road at the east edge of town, far from the old campus; and the demolition of the 1900 structure had begun. 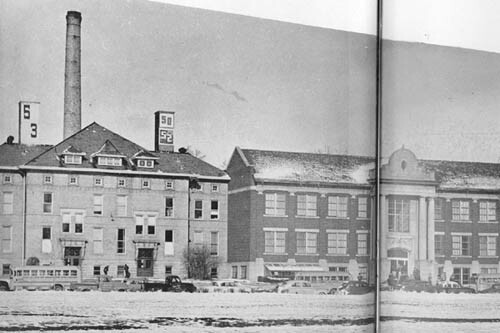 The photo at the right, taken from the 1959 Lincolnite, shows that the 4th floor and some of the building's interior had been removed to the front lawn, where undoubtedly it waited to be hauled off to the dump -- no auction then to attract collectors of antiques or junk, flea market venders, or future eBay entrepreneurs. The image is not clear or large enough to show exactly what the undervalued treasures were. This footnote incident began and ended on a dark and unstormy night around Halloween time in 1959. Several members of the DCHA, an unsanctioned club devoted simultaneously to youthful irreverence and school spirit, had gathered at its headquarters (fronted as Dial & Jones's Texaco Station at the corner of Fifth and Union). It was a nightly assembly --seven days a week. I don't remember who came up with the brilliant idea and plan that followed, as we were always dynamically engaged in mischievous brainstorming whenever more than two of us met. I don't know if we were trying to emulate our mentors in the Class of 1959 or what. After all, they had absconded with the Holy Grail of the 1900 building, so what was left for us to do? Well, we devised our own (less-noble) plan. We proceeded under cover of darkness to the alley behind the school. From there we moved quickly to the front, where numerous lavatory fixtures were just sitting on the lawn. As I recall, there were enough of us to pick up and try to make off with several thrones. In this haste, at least one was dropped and broken, shattering with a noisy clatter. One toilet was successfully carried across Broadway to the athletic field and then to the back of Central School. From there it was less than a block to Comrade Kriviskey's house on 8th Street -- the same house where one of the crew's family would later reside after the Comrade moved away (crew member also a member of this list). The crapper was delivered to the Comrade's front porch, and the moving crew quickly dispersed. Did the Comrade think the moving crew was suggesting he keep the commode as a cherished souvenir of his benevolent dictatorship? We offered him a chance to take a valuable antique guilt-free on the sly. As far as I know, there was no investigation. Was the commode taken, coveted, and passed on to his son, Bruce? I am told there were other unannounced visits to the Comrade's front porch --you know, the usual "stuffed brown bag afire, ring the doorbell, and run" routine. On the [Room] 316 pic [34.10 above] -- I at first had trouble. I kept trying to justify it as a pic shot from the stairs going to Room 412 (right next to The Down Staircase) and could not remember the alum photo albums being there -- nor could I place the fire escape nor left interior wall seen inside the room. It finally occurred to me -- this is a shot of the front door to 316 not the side door. Witness the mass of humanity fleeing from or entering 316. Room 316 -- I don't know if there was ever one like it before --but am willing to bet there will never be another like it again. Some memories come easier than others. Just to the left of the fire escape sits Room 317 -- where Arlette Eiten taught me at least Frosh & Jr. English. I think in the pre-locker days 317 may have been what was quaintly referred to (especially in my grade schools) as a "cloak room" in its original incarnation. Rooms 317 & 412--there again (literally) hangs a tale. Do you all remember Room 412? I thought not. It was situated above 316, 317 & Mark McCullough's office. During my Jr. year -- Dale Hansch supervised the Railsplitter activities in 412. He was the teacher that got the ditto master or whatever you call it for Vic Gibson and me. We mapped out and he (Dale) reproduced our chess board -- so Vic and I (we had very similar schedules) could keep our (pencil and eraser) chess game going from class to class. In any case, Steve Allison contributed the "Original Jivaro Shrunken Head" (a beautiful dangle from one's rearview mirror) which got dangled from the window of 412 to visit Barry Allen et al. in the English class Arlette had beneath our Railsplitter "period." These fist-sized, rubberized-plastic novelties were suspended from the rearview mirrors in the coolest cars of the 1950s. The above image is from http://www.piehole.net/shrunk.html. Can't remember just who did the dangle -- Steve or Vic or Jim Murray -- but the next thing I knew was that somebody said, "I had it hanging out there and all the sudden it was snatched away." 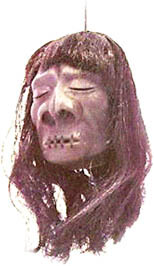 Next thing we knew -- here stood Arlette in our midst -- one hand on a hip the other swinging in a large circle -- one Original Jivaro Shrunken Head. No other heads rolled as a result. Room 412 had a very small "stage" complete with curtains -- where some of the plays were rehearsed and which functioned as a make-up room for productions (the few) done on the gym stage instead of the Grand Theater or Lincoln College stages. Arlette Eiten and Dale Hansch both contributed greatly to the enjoyable nature of my sojourn in the LCHS confines. 34.15: Mr. George Kriviskey, aka "the Comrade"
Mr. Hansch did not make my experience at LCHS enjoyable, but he taught me a lesson. 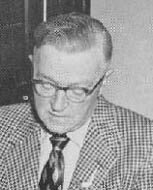 He was my English teacher in my junior year (1958-59). During one six-week period, he based our grade on the only grade he had for us during that period -- an unannounced quiz over a daily homework reading assignment. I had not read the assignment, got a D on the quiz, and so "earned" a D for my six weeks' grade. I taught literature for 30 years during my first career as an English teacher at Pekin Community High School. Throughout that time, I always based students' grades on numerous unannounced quizzes and announced major tests. That's not to say none of my students ever received a D -- or worse. In a 1970s conversation I had with Mr. Bill Smock, long-time band director at LCHS, he told me that Mr. Hansch had moved to California in the early 1960s. Mr. Smock said that Mr. Hansch traveled to California during Easter vacation, walked into some school district central office, identified himself as an English teacher, was offered a job, and took it on the spot. Yes, there were years of high teacher turnover. I recall early in my career in the 1960s when Pekin High had 30 to 40 new teachers every year. What a striking monument, with plaque, this chimney remnant would make! Note: the town disregarded my brilliant suggestion, and the chimney was removed.